When doing research for the Georgian wine book, I came across many wondrous things in this little country in the Caucasus but one of the most fascinating was the Katskhi pillar. Located near the Northern Imeretian village of the same name, it’s a tall limestone, well, pillar that sticks up some 40m out of the valley and of all things had a small monastery on the top of it. And what do Georgian monasteries usually always have in them? Yes, a wine cellar. The photos, like the one above by Denis Gavrilin where impressive and so naturally, on the way down from Racha to visit the cellar of Maradiuli that sits up against South Ossetia, my research assistant and I made a quick stop. 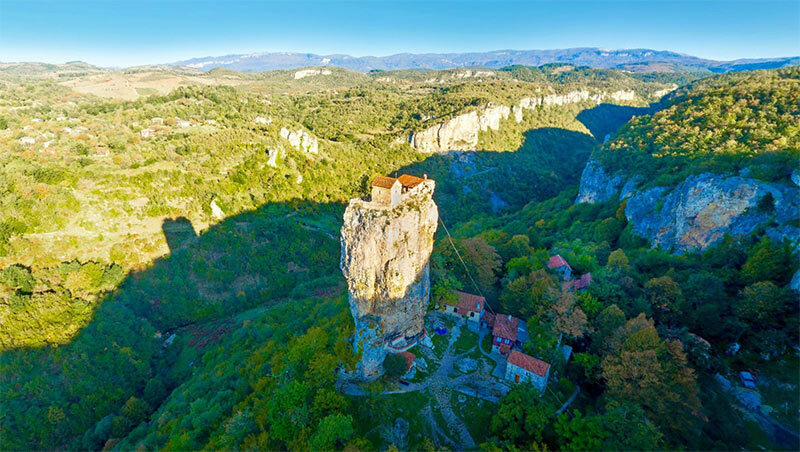 Admittedly, the photos are perhaps a tad more impressive as they look down from the top, but still, it’s a truly bizarre sight to see and to imagine that there’s actually a monk living up there (although not making wine) in the rebuilt structures blows one’s mind a bit. So, how does one visit? Well, if it were actually open to the public, you’d have to scamper up a metal ladder that’s been sunk into the side of the pillar and looks sketchier than bargain Barolo. But alas, official visits aren’t allowed like they used to be, so the church of St. Maximus the Confessor remains out of bounds, although for the ladies, that was always the case apparently. Watch this video for a bit more of an overview.